Used when turning food on the grill. Preferred over long handled forks for preventing piercing of meats. The long handles keep hands and arms safe from heat. A brush specifically made to apply marinades and barbecue sauce a safe distance away from intense grill heat. 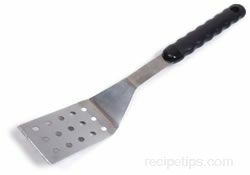 A smaller handled brush is appropriate for applying a thin coat of oil to grill grates (before grill is started) to keep foods from sticking. 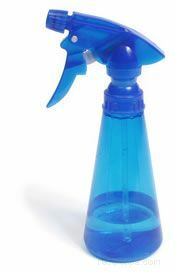 Protects hands and lower arms from the heat. Mitts for grilling are longer to protect more of the arm. Two alternatives are shown here, a silicone glove and a welding glove. Both have high heat resistance and protect the lower arm from heat. Instant read thermometers work best when grilling. 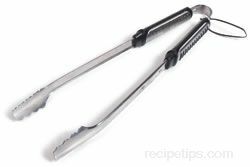 Thermometers with an extended tip are made specifically for grilling to protect the chef from heat. Testing meat with a thermometer is the only way to guarantee meat is done and safe to eat. 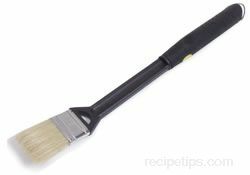 A stiff metal brush specifically used for cleaning the grill grate. The grill brush is most effective if used soon after grill has been used. 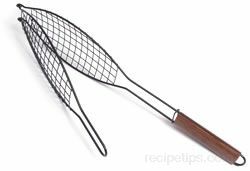 Wire grill brushes and grate cleaners are available in many different styles. Used to protect from fire flare-ups and makes clean up easier when Indirect Grilling. Essential if using a rotisserie. To extinguish flare-ups from food dripping on coals, recommended for charcoal grills only. An option for grillers for turning meat on the grill. Hooks into meat so you can securely flip it over while preventing accidental drops. Available in metal and bamboo. It is necessary to soak bamboo skewers for 30 minutes before placing on grill to insure they will not burn. 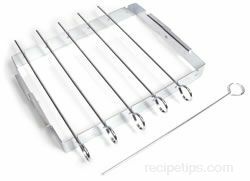 Skewer holders are also available that keep the skewers raised up off of the grate, preventing burning of kabobs. This type of basket is made to hold the fish securely as it cooks, making it easy to flip and preventing it from falling apart on the grill. It is contoured in the shape of a fish. Essential when grilling small pieces of food that cannot be set directly on grate or won't stay on skewers. The convenience of a basket is the ability to flip food over without using any additional tools. Used for meat, fish, fruits, and vegetables. Long handled wire baskets are the perfect tool when cooking directly over an open fire. Made for grilling small pieces of food, a kabob basket keeps the food contained and offers an alternative to a barbecue or meat skewer. The kabob basket is typically produced using stainless steel formed into a long rectangular cage-like shape. Some baskets consist only of the container section of the basket while others may have long handles attached to the Basket so this cooking utensil can be easily moved over the grill. The kabob basket, which may also be referred to as a Grill Basket, is an especially good tool to use for food items that are too delicate to be placed on a skewer. A cooking utensil used on outdoor grills that serves as a food holder that can be rotated continuously so the contents can be evenly cooked. 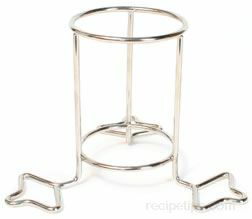 Made from stainless steel, the basket is made to hold foods such as poultry, ribs and other similar items. 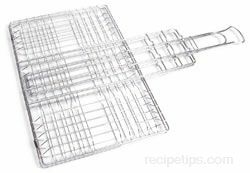 Also referred to as tumble basket, this utensil is not to be confused with a steel grill basket that is a flat container with two hinged sides that come together and is place flat, onto a grill surface. 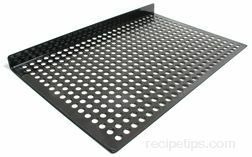 A screen or grid that is placed directly onto the grill grate to prevent small foods from falling onto the coals beneath the grill grate. One of the edges usually contains a backstop to prevent foods from sliding off the grid when the food is turned during the grilling process. Grill screen/grids are often constructed of a non-stick material and are available in a range of sizes to accommodate most grills. A grill tool serving a dual purpose. This tool sears meat, bringing out the flavor while preventing the meat from curling up on the sides as it cooks. The Sear-Top is heated before meat is placed on grill. Once meat has been placed on grill, the Sear-Top is placed on top of the meat. A rack for keeping large meat from touching grates. The rack makes removal, rotating and clean up easier. Perfect for cooking breakfast, such as pancakes & eggs, on the grill. Most can also be used on the stove. Open mesh skillets that allows heat to penetrate directly through food, available in different sizes and styles. 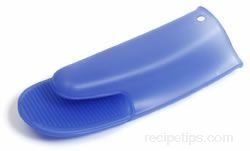 A grilling utensil that is typically made as a set consisting of the pot or pan to hold the basting sauce and the brush to apply sauces, marinades and melted butter to the food being prepared. Also referred to as grill sauce pots, basting pots and brushes are made in a variety of styles and sizes, but most often the pot will be fairly small in size, holding 2 cups or so of contents. Measuring marks are often marked on the inside and/or outside of the pots so amounts can be easily viewed. The pot may have a lid and a pour spout while the brush may be made with brisles that are formed into a flat or rounded shape. Some pots are designed with a brush that is built into the lid of the pot so the lid serves as a guard to keep hands and heat away from the hot grill as the sauce is brushed onto the food. Typically, the pan will be constructed of stainless steel or a similar material that will hold hot ingredients or allow ingredients to be heated in the pot. The brush should also be constructed of materials that will withstand heat so the bristles and adjoining areas are not affected by the heat. Silicone or nylon bristles are effective materials that works well for applying, cleaning and using again without retaining flavors of past foods that have come in contact with the brush. Any liquid, such as wine or lemon juice, can be injected into any type of food. For use with charcoal grills only. Attached to a heavy duty extension cord, this metal looped starter is placed into the center pyramid of charcoal. Within 10 to 15 minutes the coals should be red hot, the starter is then removed and must be set in a safe place. For use with charcoal grills only. 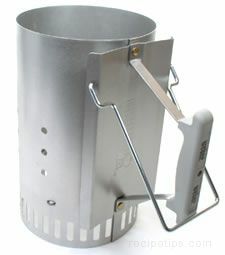 An option, other than electric, to help start grills or campfires. Most are made with a blend of compressed sawdust and wax. These lighters are multi-purpose and keep hands safely away from direct contact when starting a grill fire. A tool used for slow, indirect, even cooking of meat. Rotisserie cooking uses less heat because the grill lid stays shut. The rotisserie is motorized and rotates the meat constantly until meat is done. Coals should be built around the edges of the grill with a drip pan placed directly under meat. Another option, other than a rotisserie, for indirect cooking of poultry. A whole chicken/turkey/game hen is placed vertically on this stand. Rotating is not needed; lid of grill remains closed to allow for indirect, even cooking. 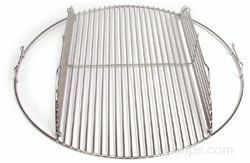 A hinged cooking grate is an optional cooking tool used when indirect grilling. The flip-up sides allow the griller to easily add coals for foods requiring longer cooking time. Used to easily remove or replace grill grate. This tool prevents a chance of burns when coals need to be added for extended cooking times. Wood chips are used to add different flavors to grilled foods such as hickory and mesquite. Follow the directions on package before use. Wood chips must be soaked for a minimum of 30 minutes before being added to your gas or charcoal grill. When using a gas grill, place the soaked wood chips in an aluminum pouch (with 4 to 5 holes poked through) or smoker box and set on top of briquettes. Spread wood chips directly on coals when using a charcoal grill. A large, hollow, upright cylinder used to ignite charcoal evenly. The cylinder is separated by a wire partition. Crumpled newspaper is placed below the wire partition, while charcoal is placed on the top. The paper on the bottom is lit and in 15 to 30 minutes the charcoal is glowing orange-red.